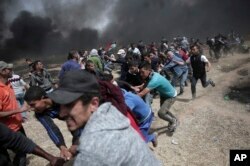 Palestinian protesters run for cover from teargas fired by Israeli troops during a protest at the Gaza Strip's border with Israel, April 13, 2018. The protesters gathered at tent camps several hundred meters from the border fence. Smaller groups of protesters approached the fence, burning Israeli flags and tires and hurling stones, prompting Israeli soldiers to fire live bullets and tear gas. Israel's military said some protesters in the crowd threw firebombs and explosive devices, while others tried to breach the border fence. Palestinian protesters evacuate a wounded man during a protest at the Gaza Strip's border with Israel, April 13, 2018. 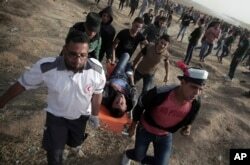 The Gaza Health Ministry said a 28-year-old man was fatally shot. It said more than 900 other protesters were injured, 223 of them by gunshots. Ten nurses and paramedics and two journalists were among the wounded, according to the ministry. Palestinian protesters chant slogans as they pull part of the fence that the Israeli Army placed, during a protest at the Gaza Strip's border with Israel, April 13, 2018. The Israeli military said it responded "with riot dispersal means and are firing in accordance with the rules of engagement." Israel has accused the Islamist movement Hamas, which governs Gaza, and with whom Israel has fought three wars since 2008, of using the protests to incite violence. But Palestinians maintain protesters are being shot while posing no threat to Israeli troops. United Nations Secretary-General Antonio Guterres and the European Union have called for an independent investigation.